Lovely LaLaLand: This door's got a new lease on life. Finally. This door's got a new lease on life. Finally. Here's the side door in our kitchen. It's painted two tones in grimy paint and features less than classy sponge painted fruit and a curtain that's barely attached by broken brackets. But, it's not all bad. The classic design and chrome handle are fantastic and something that needed to be played up. So I painted it black and we frosted the windows with our new BFF, a.k.a. frosting film. It's amazing what a coat of primer and two coats of paint will do to drastically change an appearance. We now LOVE this door. And we love saying goodbye to the old paint. By the way, this was the last of the sponge painting the old owners left behind. Remember what the master bedroom and guest room looked like a year ago? Painting this door was long overdue. And you may've noticed in the photos above that another kitchen adventure has begun. 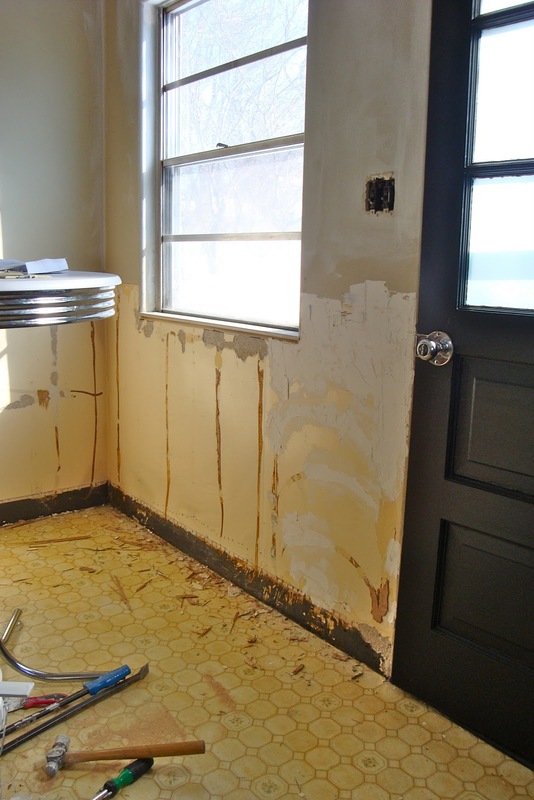 The dining nook's paneling has been on our removal radar for awhile. And while I was working on the door I simply couldn't resist the urge to start tearing it out. Now I'm working on smoothing out the walls behind it. And considering it's almost all cracked plaster and 30 year old glue, it's quite a job. 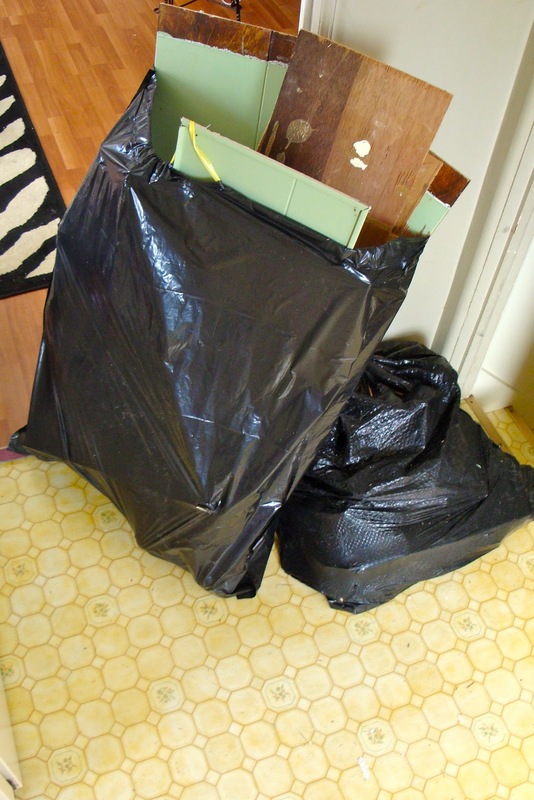 But the paneling is ready to be hauled away. Cheers to that. I JUST LOVE IT! What a major improvement and I love that you used the orriginal door and gave it a new look! Can't wait to come over and see the improvements very soon! Wow! Isn't it amazing what paint job can do? It looks fab! I love the window frosting in lieu of a curtain. Good thinking. 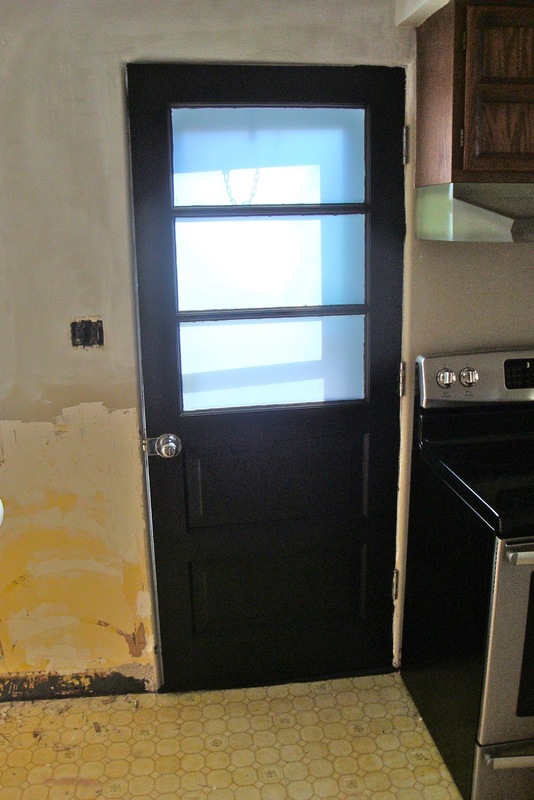 Ooooo- love the black door...you guys are so ambitious and handy1! Yeah!! Love it Kirst! !